From the window, you can catch a glimpse of the Washington Monument. Way off in the distance, past Nationals Park, the top third of the obelisk is visible. Across the street The Big Chair sits, the unofficial mascot of Anacostia. On a scorching summer afternoon on Martin Luther King Avenue in Southeast Washington, Cedar Hill Bar & Grill opened its doors to the neighborhood. It’s named after Frederick Douglass’ historic home around the corner, just up W Street. But this is no ordinary opening in just another neighborhood. Cedar Hill occupies the former Uniontown Bar & Grill, whose sign still adorned the building on the day of the soft launch. That place had a short, but eventful, history: Two years ago, Natasha Dasher, the restaurant’s owner, was busted for drug trafficking. After so much fanfare, to see it shuttered in such a way was disappointing for more than a few residents East of the River. “I think it’s a great thing that they’re able to open back up. Give the place a new start. It was quite a blow when they closed down the first time, because this became quite a popular spot,” Terry Nelson, who owns a hair salon next door, said. “It was a sad situation,” she added. “Personally, she was a nice lady,” Cedar Hill co-owner Melake Gebre said of Natasha Dasher, who was charged in U.S. District Court in Maryland and Texas with possession with the intent to distribute at least five kilograms of cocaine in 2011. The two are planning to expand the location, as well. Upstairs, they’ve knocked down walls in hopes of creating a second-floor lounge, with the potential for live music. Right now, the downstairs area looks almost exactly like the old setup, save the different color paint job inside. Episodes of Maury and a channel called Palladia played on the TV screens, while neighborhood friends reconvened at their renewed local. Crossing the river has its perks. I was in the Anacostia neighborhood for the Cedar Hill Bar & Grill open house…which was more like a “come see what is coming” community meeting. The new restaurant isn’t open for business — yet (that pesky liquor license still needs to be obtained). But the new owner Gabriel, his partner (totally drawing a blank on his name at the moment), and their lawyer wanted to invite the community in to learn more about their plans for the former Uniontown, including expanding the restaurant to the second floor and adding a DJ booth, a second bar, and a stage! No word on when Cedar Hill will be open for business but the new owners are hopeful it will be open in time for this year’s LUMEN8ANACOSTIA festival on June 22nd. Including some photos I took of what will be Ward 8’s next sit down restaurant! And not a moment too soon — right after I left the opening I went day drinking on Barracks Row. P.S. You can show your love for the Southeast quadrant by printing out your very own Southeast Love sign and tweeting it under the #SoutheastLove hashtag. Spread love, not fear! The former Uniontown Bar and Grill in Anacostia could reopen under new management as early as this summer, a year after it shut down. New operator Melake Gebre, working with investor Gabriele Tripodo, hopes to open the space at 2200 Martin Luther King Jr Ave. SE by midsummer as a restaurant and sports bar. Gebre, a native of Ethiopia, plans to serve American food for breakfast, lunch, and dinner at midrange prices. 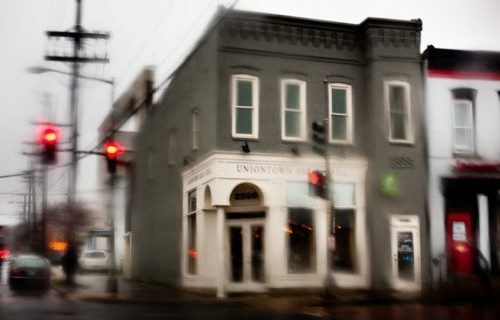 It’s only slightly hyperbolic to say that the plight of Uniontown has reflected the struggles of Anacostia more broadly. The neighborhood, full of hype and hope, has so far been unable to attract and retain sitdown eateries. But Uniontown, once its big success story, shut down not for lack of demand. Instead, it shuttered months after its owner’s conviction for smuggling cocaine, and neighbors have watched uneasily as it’s sat vacant for more than half a year, without any word of a reopening until Twitter rumors surfaced last month. Gebre, who says he was involved with the former Empty Pockets Cafe in Arlington and restaurants in Ethiopia, says he and Tripodo approached previous Uniontown owner Natasha Dasher about buying the restaurant or starting a partnership before her legal troubles began. After the restaurant shut down, they once again got involved. Tripodo, who owns nearby Union Liquors, is traveling in Africa and couldn’t be reached for comment. The ABRA application lists the venture’s name as Union Town Bar & Grill, and Gebre says he’d prefer to keep the restaurant’s well-known name. But Gebre’s lawyer, David Taylor, says that the prior tenant still has an active liquor license, and ABRA won’t allow two licensees with such similar names. Gebre is leaning toward calling the restaurant Cherry Hill Bar & Grill. Taylor emphasizes that this won’t technically be a reopening, but rather an entirely new restaurant with a similar theme. He also notes that it’s not a done deal, as the team is still awaiting various approvals from the city. Gebre says there’s “a lot of work to be done” before opening. But any concrete signs that the restaurant is emerging from its long vacancy will be welcome to the neighborhood. at Uniontown Bar & Grill?